The use of cell phones and social media is normally discouraged during a live play, but the Milwaukee Chamber Theatre has begun using Twitter to its advantage during select performances. They’ve invited members of Milwaukee’s Twitterati to attend and tweet1 one performance of each play in the Cabot Theatre. 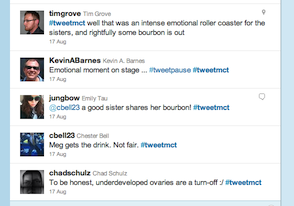 On Wednesday, August 17, 2011 I was one of nine individuals2 who tweeted the Chamber Theatre’s current production of Crimes of the Heart.3 All of our tweets were tagged with #tweetmct so people not attending the performance could follow along. In my opinion, the Chamber Theatre’s tweeting of strategic performances is an excellent marketing tactic. Why? Admittedly the tactic generates awareness of the play (and of the Chamber Theatre), influences opinion and successfully achieves many other social media objectives. But I believe the most important reason that tweeting a play qualifies as effective marketing is because of storytelling. At its most basic level, Twitter is a communication tool for storytelling. Whether telling the story of how an expensive restaurant burned your dinner, or the story about the great cat video you found online, Twitter provides a means for the storyteller to engage — and interact with — others. At the same time, a play is a story, crafted into a standard format and told in a very specific fashion. Tweeting the play allows audience members to become part of the storytelling, in some cases simply conveying the story as is, while in other cases enhancing or adding to the story. As nine of us tweeted about Crimes of the Heart, we explored character’s motivations, we made observations about choices made in set design, we noted the metaphors the author was exploring, and even added our own unique layer of humor. And as the play went on, we responded to each other’s tweets, making the story even richer. So what do you think? Is tweeting a live play a good or bad marketing tactic? Why? Share your thoughts in the Comments below.